Keep Coming Back ... 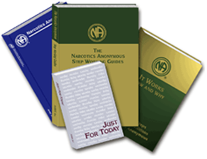 It Works"
Our name, Narcotics Anonymous, is not meant to imply a focus on any particular drug; NA’s approach makes no distinction between drugs including alcohol. Membership is free, and we have no affiliation with any organizations outside of NA including governments, religions, law enforcement groups, or medical and psychiatric associations. The next meeting of the Canada Atlantic Region will be held in Feb 10, 2019 at the Moncton Hospital on the 6th floor with the PR meeting at 10:00 AM and the regional committee meeting at 1:00 PM. Please be sure to join us as an observer or offer your services as a Trusted Servant. The next assembly is being planned for May 2019. The Central Nova Area will be the host with the event happening in Halifax as well as a recovery event called The Big Recovery Thing. CCNA XXVII is happening in Niagara Falls, Ontario. Visit the CCNA web site for more information.